Venezuelan President Nicolas Maduro's disastrous government is in much bigger trouble than most people think, not because of the student protests that have already resulted in more than 16 deaths, but by a 56 percent annual inflation rate - the world's highest - that may soon turn his country ungovernable. Most economists agree that no country can maintain a 56 percent inflation rate for several years. History shows that when countries reach that inflation level, they either take draconian austerity measures to curb inflation, or they fall into hyper-inflation, and economic and political chaos. In other words, it would be almost impossible for Maduro to stay in power until the end of his term in 2019 without stopping the inflationary spiral, putting an end to food shortages, and preventing an economic meltdown. _A traditional IMF-supported austerity package. Much like bankrupt Greece did recently, and many Latin American countries have done, Maduro could ask the IMF to rescue Venezuela with emergency loans and a package of austerity measures. That would require, among other things, massive cuts in public spending, reversing nationalizations, lifting price controls and restoring the independence of the central bank. Of course, all of this would be diametrically opposed to everything Maduro and his mentor, late President Hugo Chavez, have been preaching over the past 15 years. And, if he took these austerity measures, Maduro would most likely need to form a coalition government or reach a deal with the opposition to prevent the ongoing street protests from getting bigger, and bloodier. _A self-imposed austerity package. Maduro could try a self-imposed package of belt-tightening measures, without IMF assistance. 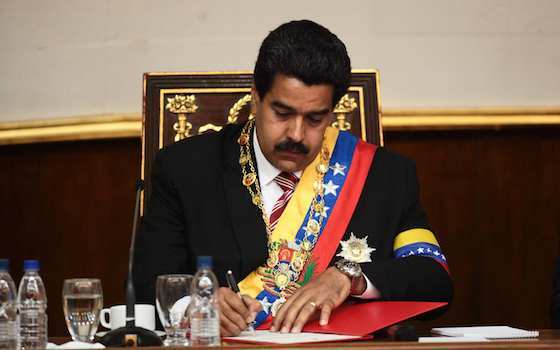 Much like Mexico did recently with its Pact for Mexico, in which all major political parties agreed on long-term economic reforms, Maduro could call the opposition to sign a national economic salvation plan. But the opposition would most likely not go for it without a coalition government that would restore a separation of powers, create an independent central bank, and call for early elections. _Dollarizing the economy. Much like Panama, Ecuador and most recently Zimbabwe have done, Maduro could stop the inflationary spiral by adopting a basket of major currencies, which in effect means the U.S. dollar. That would help restore confidence in the country's economy. But it would not only be embarrassing for Maduro, who claims to be an "anti-imperialist" revolutionary, but would result in the same draconian public spending cuts as an IMF package. It would be hard to enforce without a coalition government or a political agreement with the opposition. _A Chinese bailout. Much like Cuba did with the former Soviet Union, Maduro could ask oil-hungry China to bail out Venezuela in exchange for virtually taking over the country, and turning it into a Chinese satellite state. Problem is, the Chinese are prudent business people, and they are already worried about the more than $20 billion in outstanding loans to Venezuela. Last year, Venezuela asked for a $10 billion loan from China, but only got half of that with stronger conditions attached. Now, with greater political uncertainty than last year, China will be even less likely to bail out Venezuela, says Evan Ellis, a professor with the Center for Hemispheric Defense Studies in Washington and a top expert on China-Latin American ties. When I asked Ellis whether China would not be tempted to run greater economic risks in exchange for controlling oil-rich Venezuela, he said that's unlikely. It would require a level of Chinese control and supervision that would infuriate the United States, he said. "Every commercial and strategic opportunity that the Chinese pursue in Latin America, they do with one eye to the reaction of the United States," Ellis said. "China doesn't want to turn the United States, its biggest trade partner, into an enemy." My opinion: It's hard to say which of these options Maduro will choose, but it's clear that doing nothing is not an option for him. Praying for a new hike in world oil prices won't work, because virtually no serious economist is forecasting a major rise in world oil prices anytime soon. Maduro will have to make massive cuts in public subsidies, which he cannot enforce by himself in a deeply divided country without triggering more - and larger - social protests. Barring an unlikely Chinese bailout, he will need a political agreement with the opposition leaders he now insults every day. "Venezuela's Maduro Faces Hard Choices"